Fly over a reconstruction of one of the greatest cities in history to experience Rome as the Romans knew it. Realism, ideal beauty, and military might—explore the evolution of Roman portraits and political imagery. 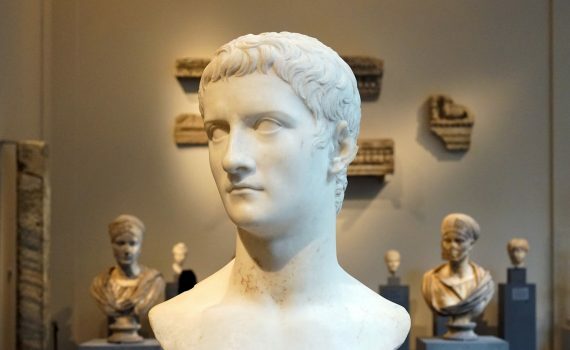 Once identified as the founder of the Roman Republic, debate over this figure’s true identity rages on. Augustus is said to have found Rome a city of brick and left it a city of marble—this altar symbolizes his golden age. Gladiators, animal hunts, and executions: learn about the Colosseum, a monumental gift to the Roman people. Trajan tasked his architect with moving an entire hill to make room for this extravagant public space. The Pantheon has one of the most perfect interior spaces ever constructed—and it’s been copied ever since. A lavish Roman house in miniature, explore the innermost sanctum of the emperor Hadrian’s villa. Built using new technologies, this building is overwhelming and unprecedented—displaying Roman imperial power. Does the abstraction of form and faraway look in this colossal portrait hint at the growth of Christianity in Rome?